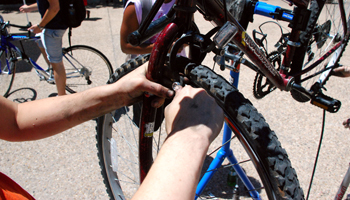 Check out our Maps page to see the locations of Bike Pumps and Fix It Stations on campus. The Kickstand is the university bike hub. Located on RLM Courtyard, it is your one-stop shop for all biking needs. Here, you can register your bike; buy helmets, locks, handpumps, lights, tubes, patch kits, bike lube, water bottles, or other biking supplies; rent locks; and use air pumps or other tools. If you lose or break a key, or if your lock won't open, PTS can provide a lock-cut service. You must be a current UT student, faculty or staff member with a valid UT EID. We only cut locks for bikes that are on UT Austin main campus. We are available to cut locks M-F from 12PM - 2PM by appointment only. To request an appointment for a lock cut please email bicycle@utexas.edu with the following information. Someone will respond to your request within 24 hours to schedule an appointment. Once the appointment is made you will need to visit the Trinity Parking Garage cashiers window M-F 8AM -5PM prior to the appointment to pay the $20 lock cut fee. At your appointment please present your UT ID and payment reciept to the locksmith for verification. A well maintained bike lasts longer and is easier to ride than a neglected bike. Check to make sure your tires are properly inflated, your brakes work, and your chain can move smoothly before riding. Airing up your tires and lubing up your chain are easy enough, but if you don't feel comfortable working on your bike take it to a local bike shop or learn as you go at a community bike shop. If you own a multi-speed bicycle and it's been awhile since your last ride, it is a good idea to run through your gears. You don't want to get stuck going up a hill to find that one of your gears skips or derails your chain. Even if you don't want your bike anymore someone else does! You can sell it, donate it to different organizations, or give it to a bike-less buddy of yours. Not only will someone else be happy to have a bike, but abandoned bikes take up much needed parking spaces on campus. PTS will also accept donated bikes which will be auctioned off in the fall semester. All auction money goes back to the Bike UT program.